The third part of my filmmakers guide/memoir went live on Amazon and Barnes and Noble today. It documents what was perhaps the most stressful two weeks of my life: promoting a film during the 2004 Sundance Film Festival. We made a film about the whole experience called The Misbehavers, but because of legal issues with those involved in it, music licensing, and the threat of lawsuits, it will never see release. In fact, I"m almost counting days until I get a cease and desist about this book. But since everything contained herein is the truth, and I have video evidence and journal entries to back up my story, I'm not too worried about anything like that affecting me. But in case it does, buy the book now. 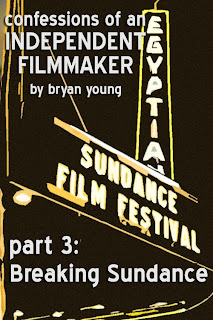 In the third part of his "Confessions of an Independent Filmmaker" series, he documents his time promoting a film called Abby Singer at the Sundance Film Festival. Abby Singer featured Brad Pitt and Jake Gyllenhaal and was renowned for its guerilla marketing campaigns. From stealing cameos to breaking into every major film studio lot to drop trailers, Abby Singer had done it all. And when it wasn't programmed in the Sundance Film Festival, the filmmakers turned to the author and his cohorts to market the film. They navigated the strict laws against most forms of film promotion in Park City, Utah, and launched one of the most talked about marketing campaigns in the festival's history. This first hand account brings readers through the drama, the struggles, and the marketing avenues taken to put the name "Abby Singer" on the tip of every tongue during one of the biggest independent film festivals in the world. Be sure to check out Part 3 on on Amazon and Barnes and Noble today.